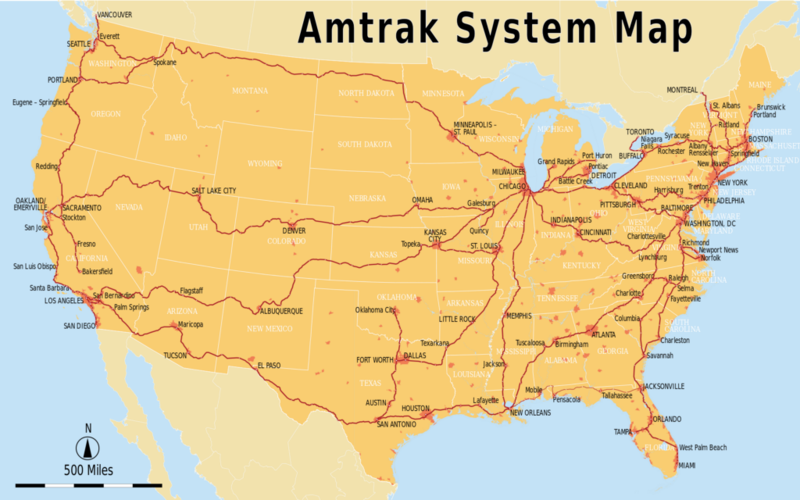 Amtrak System Map. CC BY-SA 2.5. My wife isn’t so sure about this. It’s the wild hour of 9:30 pm, and she’s secured to the top bunk of our bedroom compartment as we haul past the Cascade mountain range. The bottom bunk is almost twice as wide, which is nice in theory, but the built-in trash receptacle is inches from my face. We’re riding the rails, thanks to some strategic credit card bonus planning and the benevolence of various friends and family. I’ve dragged her on another one of my train trips. Our plan was to fly to Seattle from our home in North Carolina, then take the Empire Builder train nearly its entire 46-hour route, from Everett, Washington to Chicago, from where we’d fly home. I can’t help it — I like trains. But this path wasn’t chosen by accident. Coincidentally, a disproportionate number of our relatives have amassed in areas serviced by Amtrak. We had her 100-year-old grandfather and uncle outside of Seattle and various cousins inside city limits; her brother and my uncle in Minneapolis; and my brother and multiple high school friends in Chicago. With our grand tour, we could knock off, say, five year’s worth of visiting obligations in one fell swoop. In preparation for this trip, I signed up for the Amtrak Guest Rewards MasterCard last fall. In exchange for paying the $79 annual fee (and charging $1,000 within three months), I would get 20,000 points and a companion voucher. You can redeem Amtrak points for hotels, car rentals, and gift cards, but I didn’t care about of any these. This was a wholly tactical move, just like signing up, two years ago, for a Delta SkyMiles Amex, whose bonus would give us enough combined points to cover two round-trip tickets to Madrid. Once I factored in the few thousand Amtrak rewards points left over from five years in NYC, we’d scored enough points to cover all but the last leg, an 8-hour turn from St. Paul to Chicago. (The companion voucher covered half the trip, so even that last leg was a deal.) We were pleasantly surprised to discover enough leftover SkyMiles to get us from Asheville to Seattle for free, making our only upfront costs — apart from the final leg ($68) and the Amtrak MasterCard yearly fee ($79) — the flight home from Chicago and the three nights we spent in Essex, Montana, just outside the southern boundary of Glacier. So was it cheap? Sure. But the trip wasn’t without it’s challenges, especially for the less transient-minded. In the end, we slept in 10 different beds, stationary or otherwise, inflatable or pull-out, in 14 nights. Then again, we also bought pot (legally! ), hiked a national park, and browsed the Art Institute of the Chicago, all within the same allotted vacation block. Experiences (and prices) like those are why I’ve continued my love affair with Amtrak. In fact, this was a shorter, gentler reprise of another two-week train trip. In 2012, I traveled from NYC to Emeryville, CA, by way of Washington, DC, for a grand total of approximately 72 hours. Less savvy about credit card points, I had purchased an 8-segment/15-day rail pass, which is still one of the nation’s best travel deals at $459 (about the cost of two round-trip fares between NYC and Washington, DC, at peak hours). There was something indescribably cozy about walking from my office on Madison Avenue, taking the escalator into the bowels of Penn Station and, 12 days and 13 states later, materializing at the foot of the San Francisco Bay. So, fine; I’m a sucker for Amtrak. I like spacing out into the countryside, and I suppose I find the scent of aged carpet mixed with microwaved bagels not un-comforting. (Actually, this may be unfair. On the long-distance trains, the dining car has real food that’s truly good. Go for the flat iron steak.) Compared to trains in Western Europe — and hell, probably Eastern Europe, at this point — our national rail service is undeniably meager. (It’s not really its fault, though that’s a discussion for a different time.) And I don’t even have enough Twitter followers for the Amtrak writer’s residency. But whatever the train’s shortcomings, it’s an affordable option for a long vacation, temporally or geographically. There are worse ways to drag people around. This article is part of our ‘Summer Series’ collection. Read more stories here. Adam Rosen works in academic publishing in Asheville, NC. Ask him about Amtrak at @adammmmmrosen.